This is one of the boxes my Dad packed for a 10-14 year old boy. The box is actually an envelope box-the bag and puzzle fit better that way, but it didn't take up more room than a shoebox-we figured the square area. 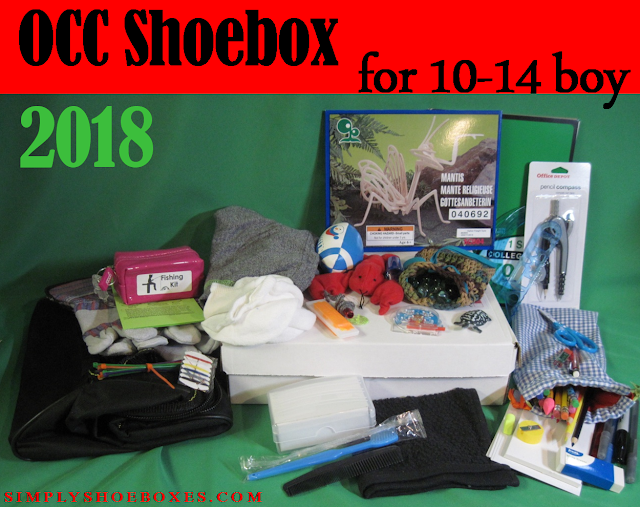 If you'd like ideas for other ages be sure to check out my posts on OCC shoeboxes from 2018 for: Girl 2-4, Boy 2-4, Girl 5-9, Boy 5-9, Girl 10-14, & Boy 10-14 (will be updated with links as I post those boxes, until I do, here's a link to all the shoebox examples posts). Here's more posts with ideas on shoeboxes 10-14 year old boys.